The Rowans Care Home (off Bollinbrook Road) have invited us to help organise a community garden in their grounds. If you would like to know more about this project can contact Stuart Potter on 07594 988977. This week we learned that HMRC will treat us a charity for tax purposes, so we can reclaim Gift Aid on any donations received. 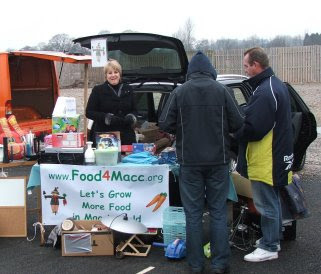 Local supermarkets Tesco and Sainsbury's have agreed to support our work, and local garden centres have started to offer 10% discounts to Food4Macc Members. See our new web-page of Supporting Organisations . 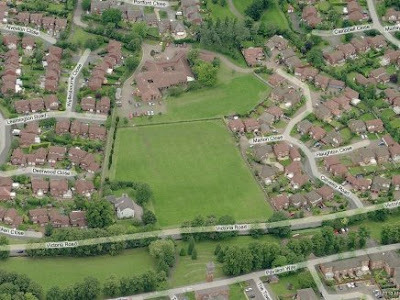 The Planning authorities have now written to us making clear what we CAN do on the Beech Hall School site. 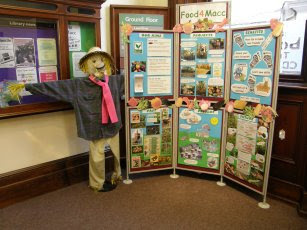 The main constraint seems to be to avoid any permanent structures, but most of our planting plans will be OK.
After lots of feverish printing and laminating last week by Judy, Julia, Melissa, Sally and Deb, we unveiled our week-long display in the foyer of Macc Library this morning. The scarecrow is by courtesy Sally's concept sketch - and Judy's hat stand and ingenuity! The theme is Past, Present and Future, with other panels devoted to our Aims, our current Projects, and the Benefits we anticipate. There is leaflet dispenser which will give people the opportunity to get in touch with us. Thanks to Mel and Stuart who broke the ice on our fundraising campaign, making £105 for our group funds by running a stall at the Rugby Club car boot sale on Sunday. 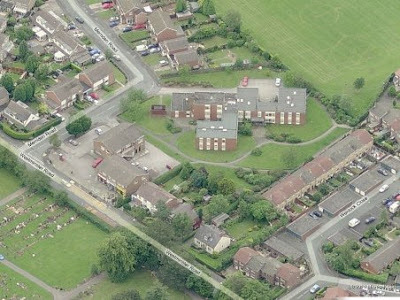 We are now working with The Rowans care home off Bollinbrook road, where the manager Michelle is planning to hold a meeting with residents of adjoining houses to discuss a community garden in the grounds. We are also working with Cheshire East Green Spaces department on a possible community orchard on the field in front of the hospice. Diana Moss is putting together an initial proposal, and a public meeting is likely early in April.